Time. Do we ever have enough? I blinked for a moment and my tiny baby was a boy, running eagerly from me into his classroom without a backward glance. The mornings where he clings to my hand and kisses me goodbye are fading. That heavy feeling in my chest is both fierce pride that he is growing and a sadness. Time passes, and little by little our littles become bigs. For our children time is the thing in-between laughter, playdates and Christmases. Friends gently advise that you don’t wish it away. That it will fly by, but you laugh and don’t see how it could. Sleep deprivation makes the day go by slowly. But it does go by, a day, a month, years. When I think of my childhood I automatically think of sun, it felt like perpetual summer and waiting for birthdays. Dressed like a cross between a flower pot man and a rag lady, life was cartwheels in dungarees and velvet leotards. Oddly I think I can remember with more clarity more events in my childhood that I do early parenthood. Again it’s the sleep deprivation. It melts brain cells. Do not let anyone criticise you for taking to many photos or shaky videos. They are yours to capture. Relish the time you have. Let’s face it as parents we feel like we never have enough. I am ALWAYS RUSHING. Watching the clock. Trying to fit in as much as possible. JORD watches sent me a lovely timepiece as a reminder to relish the time I have. It’s a unique style but wears well with most of my outfits. Its light without being fragile. My simple yet beautiful Frankie series watch is made of dark sandalwood paired with a smoke pastel face. I love its minimalist style. 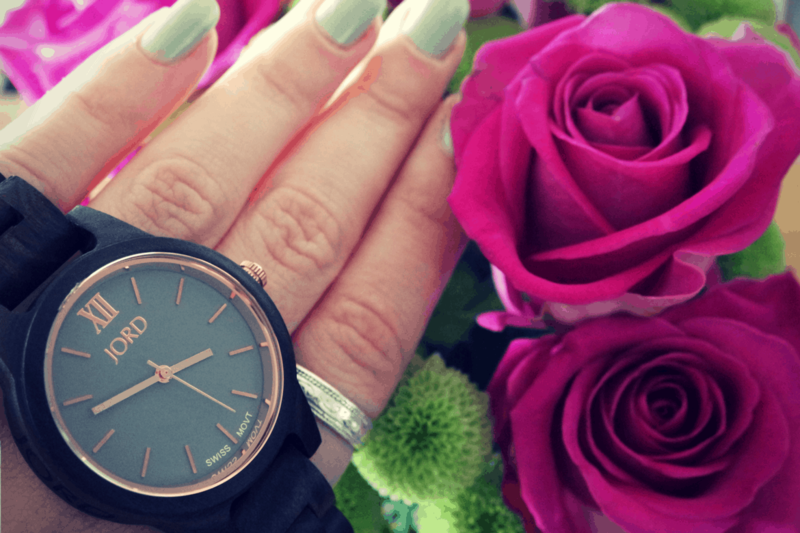 The women’s watch collection has a wide range of colours and face styles. Sent in a beautiful wooden case it is a lovely quality item. Perfect for a gift. Mine retails for £146 and they are shipped all over the world free. Note that you might incur a small custom’s charge as the watches are shipped from the US. JORD watches use only 100% natural wood and we refrain from the use of toxic chemicals to either treat or protect the wood. It has an ultra slim case powered by a Swiss movement. They recommend Lemon oil to clean it and keep the wood supple. They are splash proof but don’t do the washing up with them on! JORD can size your watch before shipping. Otherwise a local jeweller can help for a small fee. It comes with a couple extra links in case and has an easy press fastening mechanism. My little boy wore it for a couple of hours and he loved that it was made out of a tree. The fascinating life of five year olds. JORD have kindly offered a $75 e-voucher for a prize and everyone who enters also gets a $20 e-gift card, excluding the winner. The contest is live now, and will end Sunday 11/27/2016. JORD is responsible for providing the voucher. There is no cash alternative to Prizes which are subject to availability, non-transferable, non-negotiable and non-refundable. Prizes may not be sold, offered for sale or used in connection with any other competition or promotion by the Prize winner. Disclaimer: This post was made in collaboration with JORD. I was gifted an item for my honest review. Beautiful pics and you’re so right about time – I can’t believe how quickly it passes these days. (Unless the Popple has decided she wants to climb up and down the stairs repeatedly. Then it goes VERY, VERY SLOWLY.